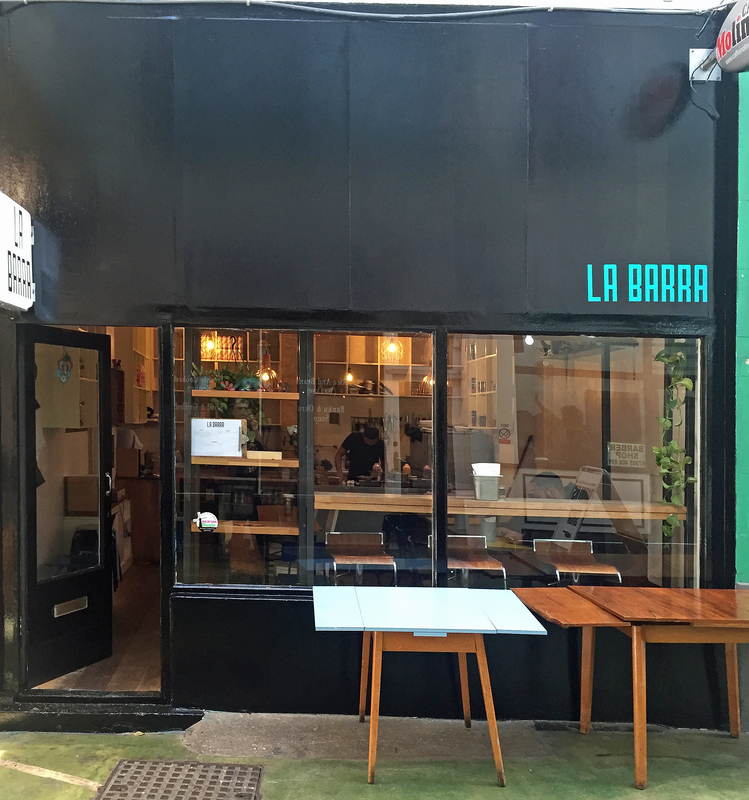 This taco restaurant and bar was taken over at short notice, done up on a shoestring, so you can see the leftovers of Rosie’s, which turned into a Persian cafe and is now La Barra. It opens for a short time – three days a week – and is still so hidden that on a Friday night the place was empty at 7.00pm. The service was friendly and, unsurprisingly given we were the only customers, prompt. It has a blessedly short menu of Tacos and sides with a vegan option. The focus is on with slow roasted meats so this isn’t your usual slop on some hot sauce type of taco; each is meant to taste great. There are four types of taco with chicken, sweet potato, beef or mushroom base; and two sides guacomole or fermented chilli aged queso with either taco chips or chicharron (pork scratchings). We ordered three tacos (not the chicken) and chicharron with the queso. The chicharron came first and although still deep in conversation we managed to polish it off with our drinks (Margherita and Red Stripe). The green chilli sauce was very hot but all the items (queso, unamed pink sauce, chilli’ed sauce) were separated so you could choose how spicy you wanted the dish. The three tacos came with many ingredients and it was hard to work them all out after you had rolled it up. But we definitely liked the vegan mushroom (with cashew crema and guacomole) and the 20hr beef short rib (with Spanish onion and salsa de arbol). But we were not too certain about the sweet potato with queso fresco, pickled cactus and pink onions. The main reason was differentiating the textures. You can differentiate the queso fresco because of the acidity but it was harder to work out the pickled cactus. If I went again I would go for a group of the same tacos and not a variety to learn more about the flavours. 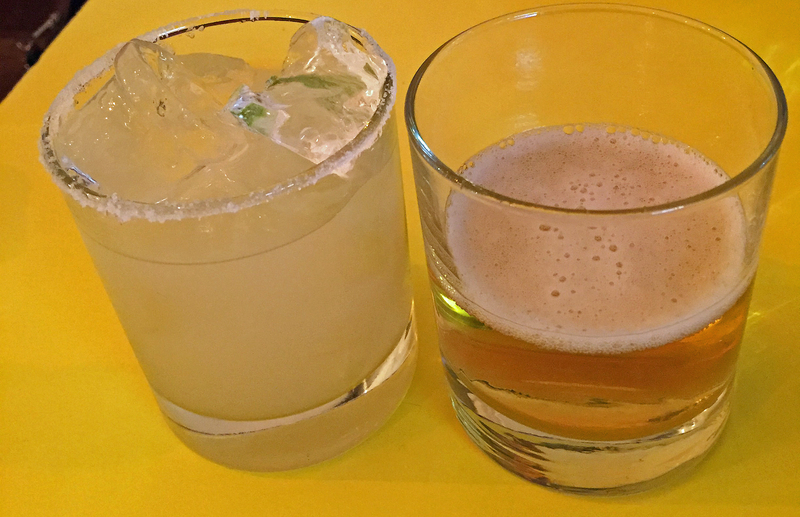 There is a wider drinks menu of mainly tequila and mescal to choose from and tap water appears first. We were worried about the finances of such a small place so decided not to wait but to rush out this review. They do have competition nearby but those bars and restaurants are very noisy. It was ideal for a night to chat but they need more customers so everyone drop by, have a special tequila and soak it up with food. 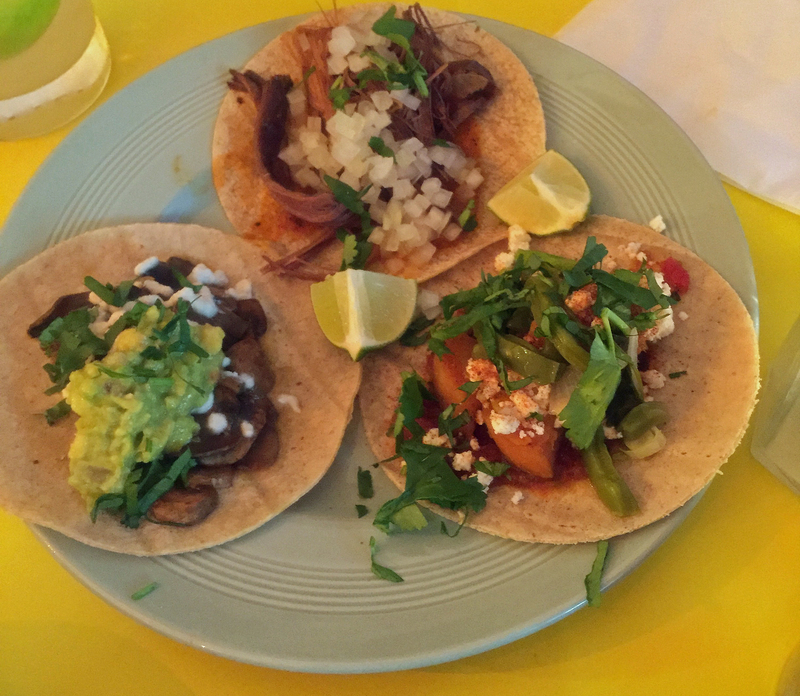 Tacos are cheap – three for £10.00 and the bill for two came to £18.50, including the drinks.